Far From Diwali's Lights, The Warm Glow Of Home : Code Switch South Asian communities around the world are celebrating good over evil, knowledge over ignorance, light over darkness. Sunday is Diwali, the Hindu Festival of Lights. The holiday isn't well-known in the U.S., though, so families rely on themselves to keep the tradition alive. 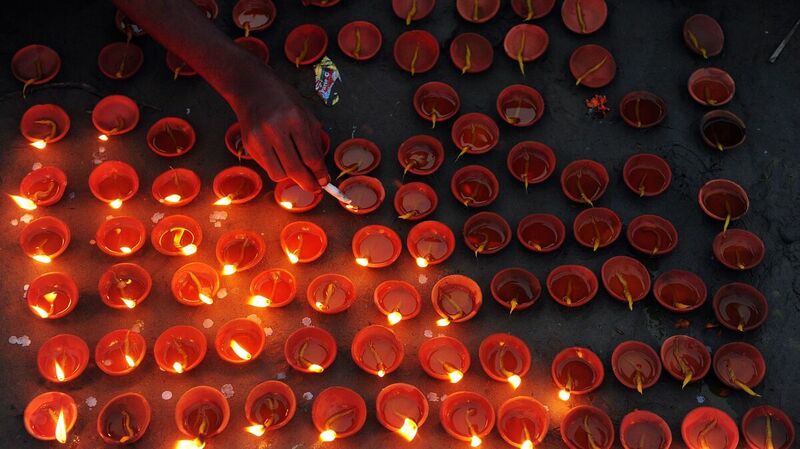 Little oil lamps mark Diwali celebrations in Allahabad, India, far away from American homes. Small flickering oil lamps known as diyas are lighting up Indian homes in South Asian communities around the globe on Sunday as hundreds of millions of people observe Diwali. Otherwise known as the Festival of Lights, it's a religious celebration of self-awareness and reflection. 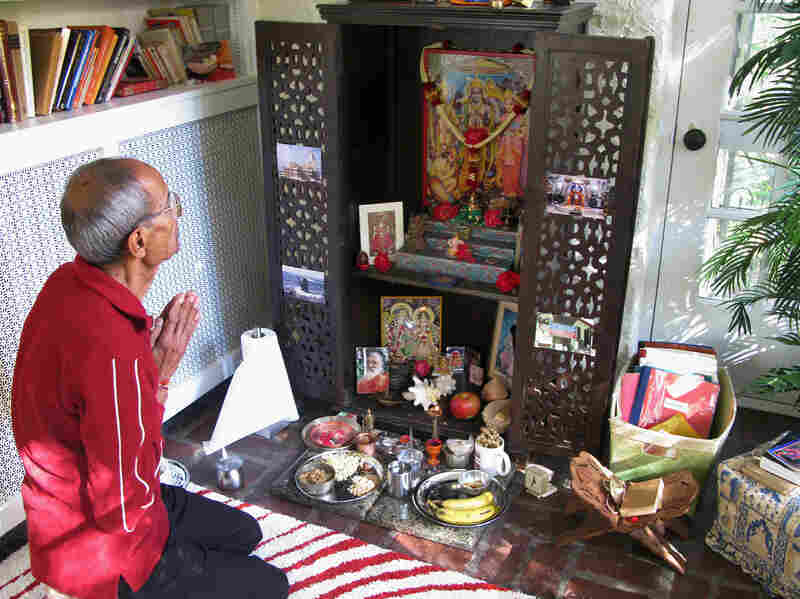 Diwali is a public holiday in a number of other nations, but it's not nearly so well-known in the U.S., where families must rely on themselves to keep the tradition alive. Nestled among old colonial homes in Haverford, Pa., the Shukla home is a vibrant display of light and colorful decoration. Inside the kitchen, it's a feast for the senses. For the Shuklas, Diwali ushers in a new year for self-reflection or, as they put it, finding the light within. Celebrations begin with a ritual of prayer called Lakshmi Puja. Shoes off, seated on the floor, three generations of the Shukla family take part invoking the Hindu goddess Lakshmi to bring wealth, prosperity and peace to the home. The gathering then evolves into a retelling of centuries-old tales of Hindu gods battling between good and evil, symbolizing a person's struggle within. As second-generation Indian-Americans, Suhag Shukla and her husband, Aseem, are keenly aware of how easy it is to lose touch with tradition. They say Diwali pulls their kids back from the distractions of western culture to remember a heritage that places heavy emphasis on devotion to others. The ritual ends with a song, Hanuman Chalisa. Aseem Shukla says it captures the resilience of Hindus who, generations ago, left their homeland behind, but have never let go. "That came with them on the boats, when they came as sugar cane workers, plantation workers," he says. "That was, like, the few things they had, so they sing this with a lot of passion." But, at the end of the day in the Shukla home, Diwali represents the celebration of family.